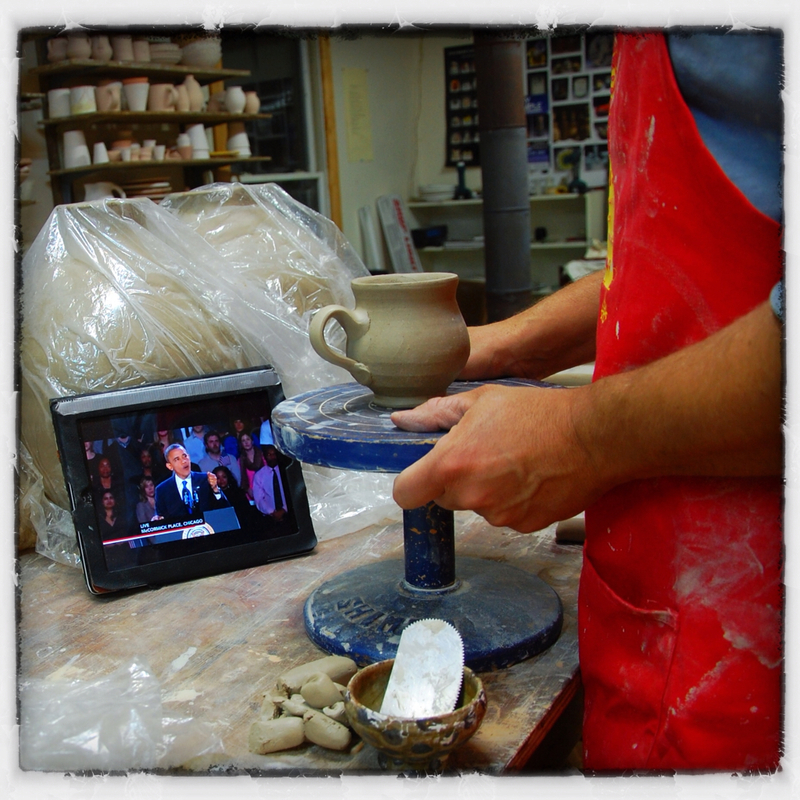 A person in my position as maker in chief has no business sitting down to write about pottery. He needs to be strapped to the wheel making pots. 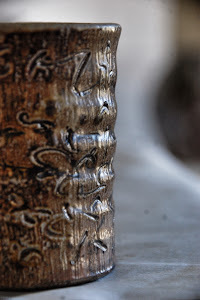 With just a few more days to make pots for an upcoming firing, writing a blog post is the last thing I should be doing. But I need a break this evening and I have been promising this post all day in my other channels of social media. The other thing I should not be doing for this coffee break entry is writing about an empty cup of coffee. Normally I take an actual real time break with a particular cup of joe. Sipping while writing is how thoughts flow best. But here I sit at 10:30 at night trying to summon some distant memory of a break I took earlier in the day, amongst the sunshine, the table of pots covered in plastic or the sheen of being just thrown. The coffee was fresh and hot. The pottery is at its peak when the coffee is just made. The handle is warm, not hot, like the side of the cup that isn't quite ready to be "cupped" in one's hands. Held comfortably at a distance, the cup is coy with its cargo of hot. Moments later the drink is drunk and cup is retired and work continues. But only after a few pics are snapped. That is the way of the potter blogger. One foot is inside the moment, while another steps back to grab the camera to record it. At the core of my blogging experience is this dance between the making and the recording of the process. Now the sharing of it. 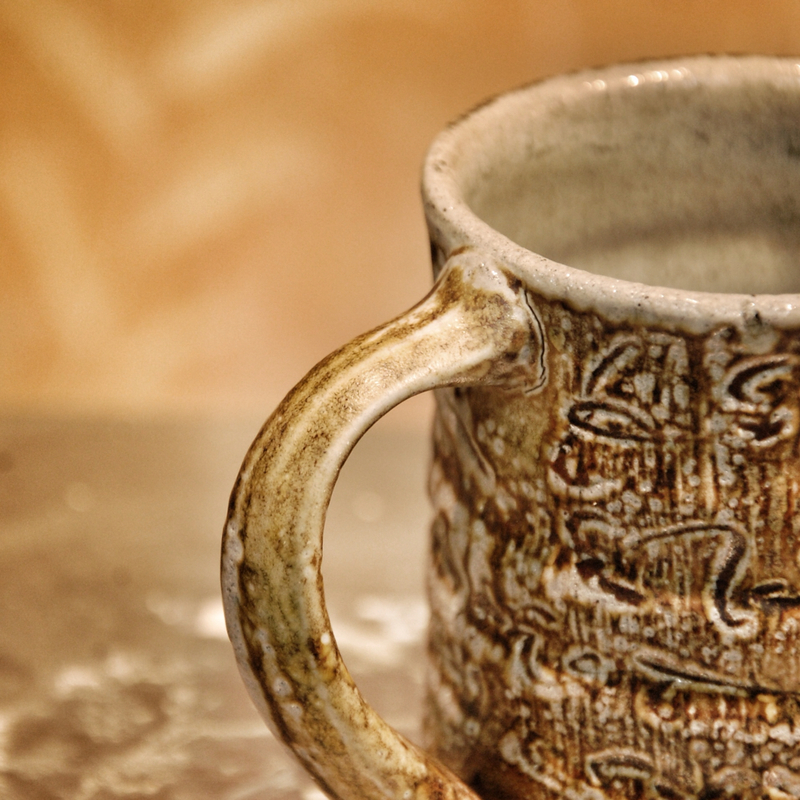 The cup is by my brother in clay, Mark Shapiro. In a masterful way the cup is a paradox of stoneware density and it's soft touch. 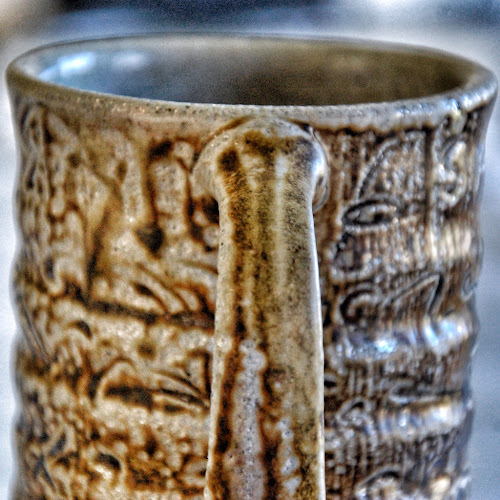 The rise of the cup undulates with a continuous spiral of a deep throwing groove. 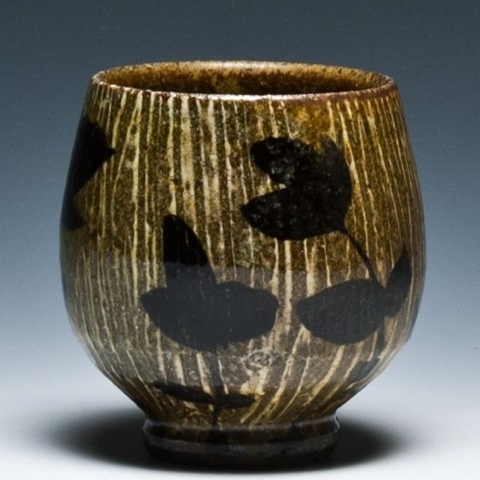 The salt glaze varies from smooth sheen to a sugary melting with fly ash from its wood fired origins. The unreadable faux script covers the pot in a message in some unknown pattern language. Some of the marks almost look like letters or numbers, Misspellings? Codes? 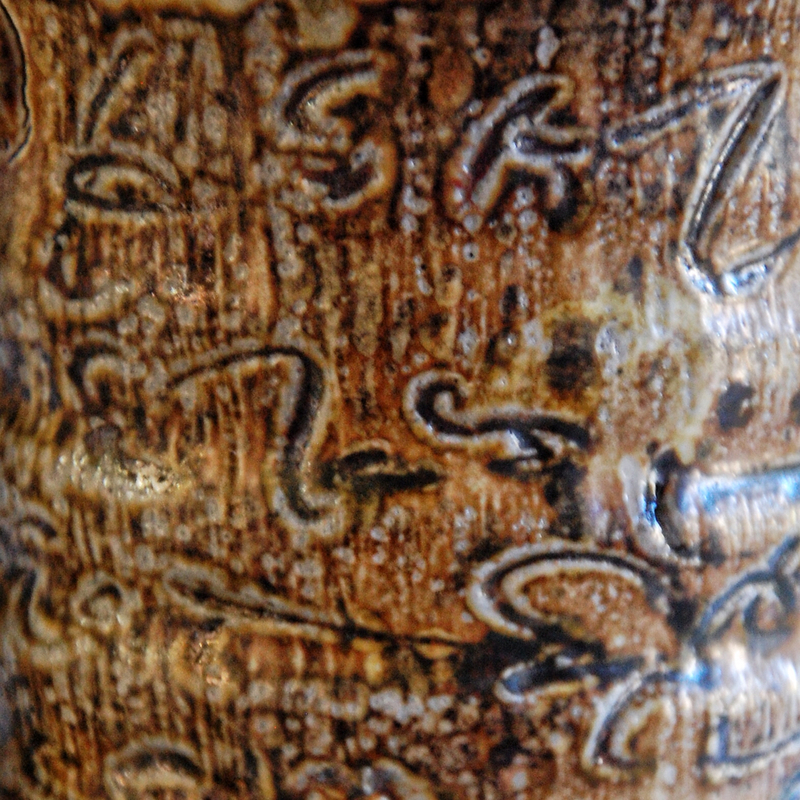 The marks are as varied as the salt glazed wood fired surface. Evidence that the pot was once stuck to a wheel head and cut with a wire graces the bottom of the pot in parallel lines where wire was pulled straight beneath it and the salt and fly ash have fused themselves ever so subtlety. The unusually narrow handle has the robust of a handle made out of iron, instead of clay. Sometimes it's more about the confidence and the attitude of the maker than the physical attributes of the material. 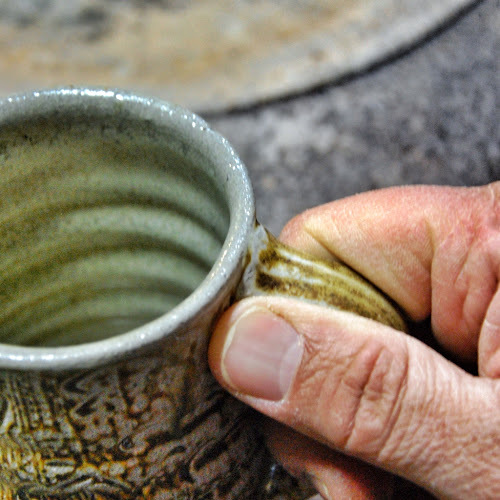 My thumb fits nicely at the topside of the handle, while my truncated index finger points comfortably at the center of the cup, middle finger loops inside, and ring finger supports outside and underneath the handle. 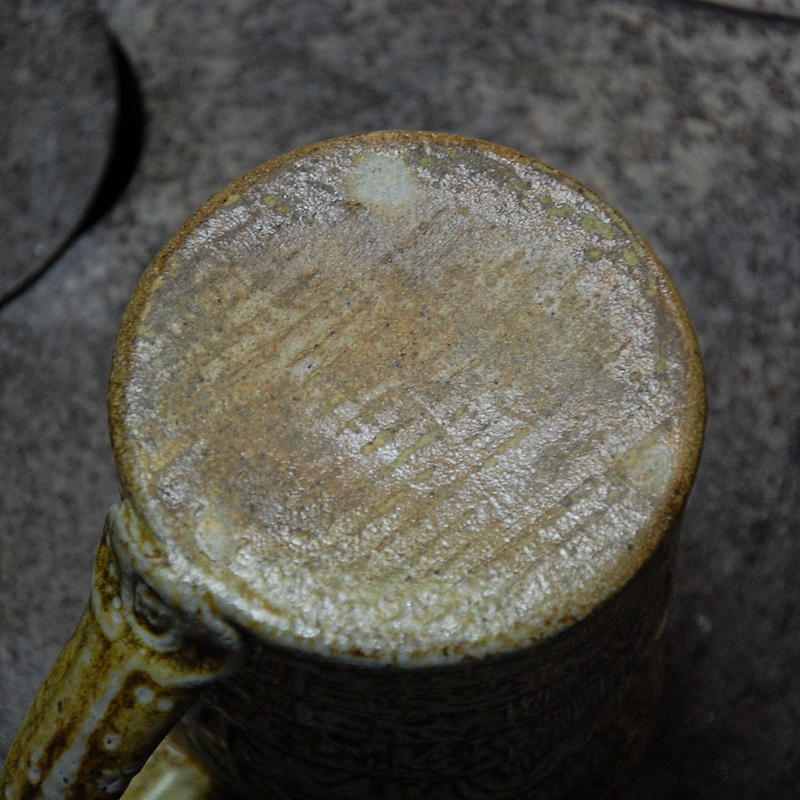 The fine vertical lines on the cups sides are a result of brushing the freshly applied slip and might foreshadow the lines one might find after emptying the cup and seeking out a view of the bottom and its fine parallel lines left by the wire tool. Well, this is what I have learned of this pot so far. I have had dozens of cups of coffee since stealing it from Mark at this past summer's Cousins in Clay Sale where Mark and my other brother in clay, Sam Taylor were my guests. (along with my Seagrove cousins, Bruce and Samantha) and barring its premature Waterloo, many mouths will drink from it for years to come. Now it's back to the wheel. Somehow I'm sure this cup's qualities will creep out of my subconscious onto my own pots. That's how it all works in this inheritance of pot making. That's why you should also be careful which pots you steal, literally or visually. 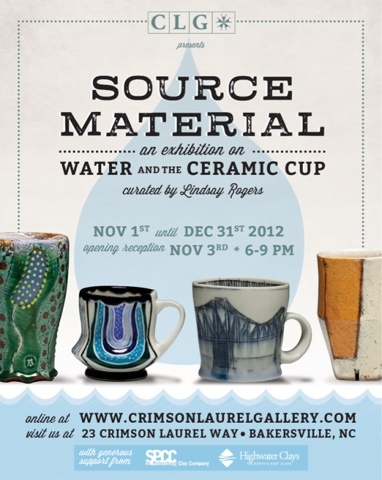 Lindsay Rogers, former member of the Snow Creek Pottery Cartel, and now a grad at the University of Florida, has curated “Source Material: An Exhibition on Water and the Ceramic Cup”, a fantastic show at my lovely neighborhood Niche award winning Crimson Laurel Gallery! 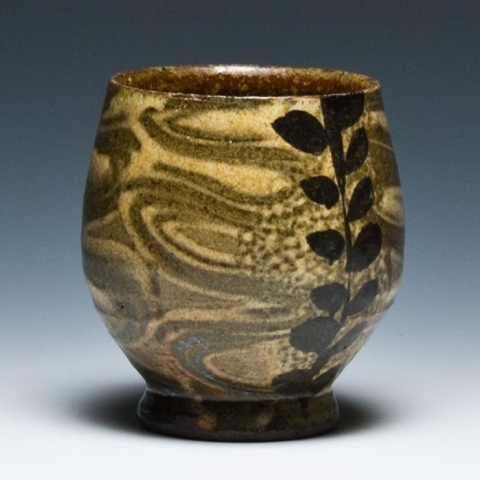 Lindsay has selected 68 of her favorite ceramic artists from around the country for “Source Material” and they represent a broad range of unique styles and techniques. Adam Field, Adam Posnak, Amy Smith, Andrew Avakian, Audrey Rosulek, Ben Krupka, Birdie Boone, Brett Freund, Brian Jones, Chandra DeBuse, Cheyenne Chapman Rudolph, Chris Pickett, Courtney Martin, Courtney Murphy, Dan Anderson, Dandee Pattee, Diana Fayt, Donna Flanery, Doug Peltzman, Emily Reason, gwendolyn yoppolo, Hayne Bayless, Hiroe Hanazono, Jana Evans, Jason Burnett, Jeff Kleckner, Jennifer Allen, Josh DeWeese, Joshua Stover, Julia Galloway, Kari Smith, Kathy King, Kelly O’Briant, Kristen Kieffer, KyoungHwa Oh, Leah Leitson & Martin Tatarka, Leanne McClurg Cambric, Linda Arbuckle, Liz Zlot Summerfield, Louise Harter, Mark Errol, Frank Martin, Martina Lantin, Mary Barringer, Michael Hunt, Moi, Natalie Tornatore, Nicole Gugliotti, Nicole Aquillano, Nigel Rudolph, Ronan Kyle Peterson, Sanam Emami, Sean O’Connell, Shadow May, Shane Mickey, Shawn Spangler, Shoko Teruyama, Simon Levin, Steven M. Godfrey, Steven Roberts, Sue Tirrell, Sunshine Cobb, Susan Feagin, Tara Wilson, Tina Gebhart and Victoria Christen. The exhibition is already open online as many of you, no doubt, know and have visited, and will remain through December 31. 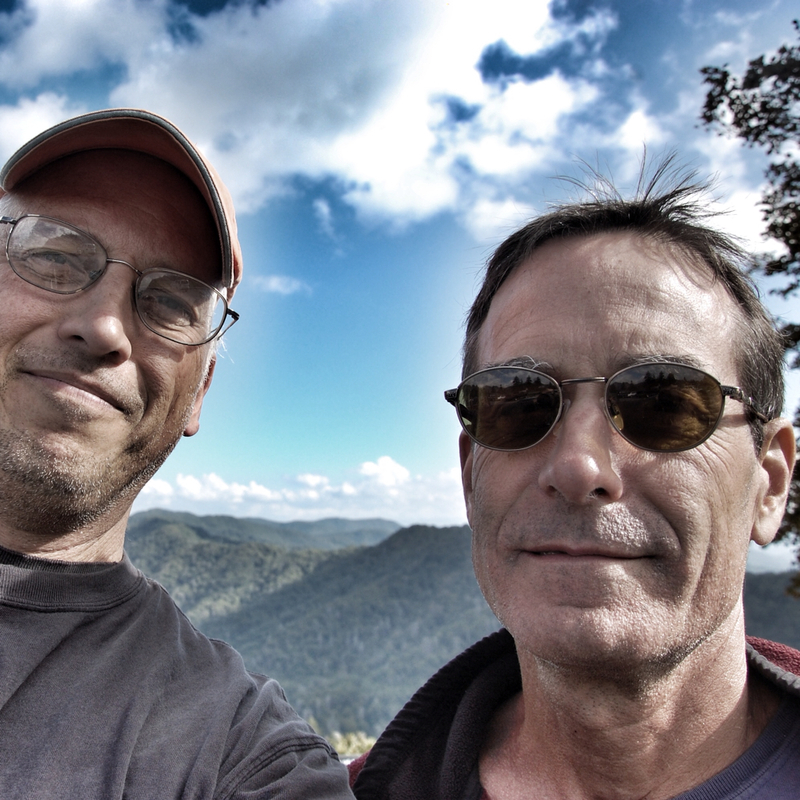 I hope to see you for an artist reception this Saturday, November 3 at 6pm in beautiful downtown Bakersville! Just look for the building with the big crowds of pottery lovers as your wagon rolls into town.